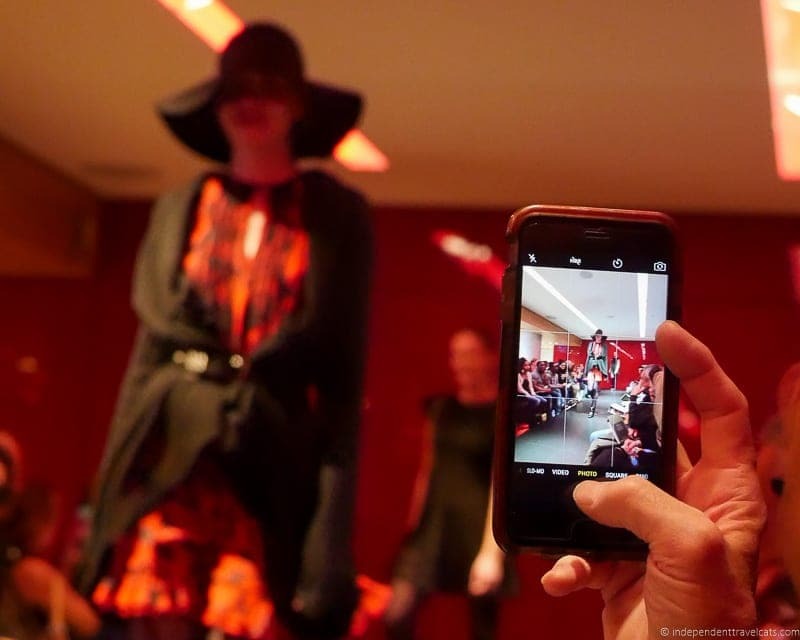 Interested in attending a fashion show in Paris? Paris is one of the Big Four cities of fashion in the world along with London, New York City, and Milan, and it is no wonder that many visitors to the City of Lights are interested in catching glimpses of svelte models sashaying down a catwalk in the latest original silky creations. But chances are that your visit to Paris won’t coincide with the semi-annual Paris Fashion Show, and even if it did, tickets are almost impossible to obtain for those of us who are not part of the fashion industry or press world. But no reason to despair, you can still attend a fashion show held regularly throughout the year at the Galeries Lafayette. Until recently the department store offered a free fashion show in Paris; however, they began charging admission in 2017. 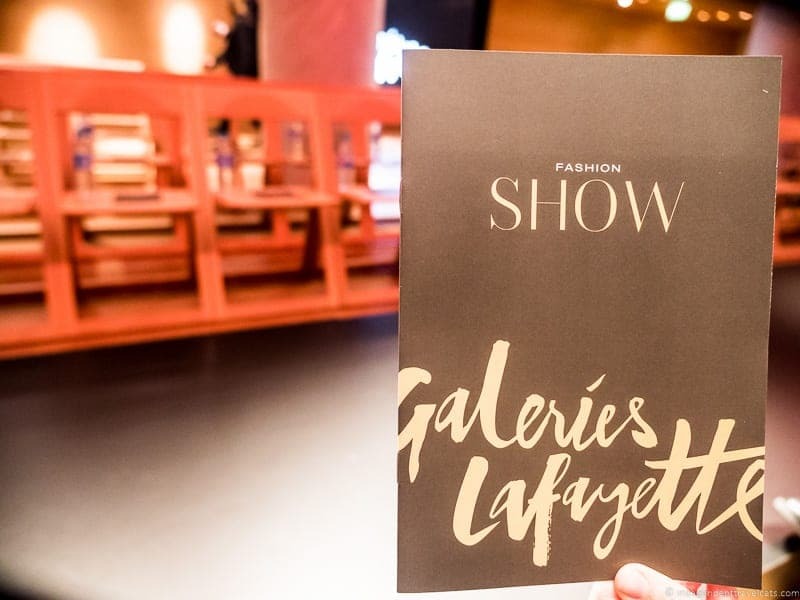 We’ve attended the 30-minute show held on Friday afternoons at the Galeries Lafayette twice. 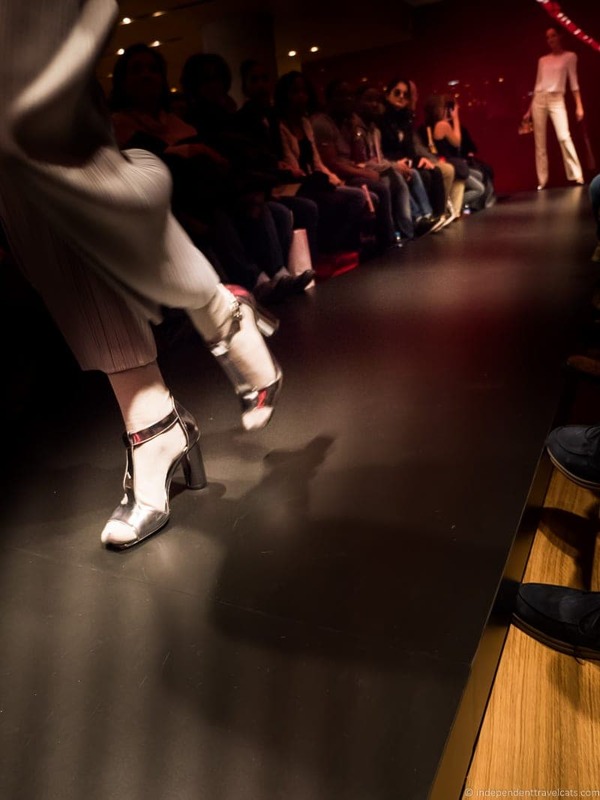 We’ll share our experience of making reservations and attending the fashion show, as well as provide some general tips and information on attending this fashion show in Paris. 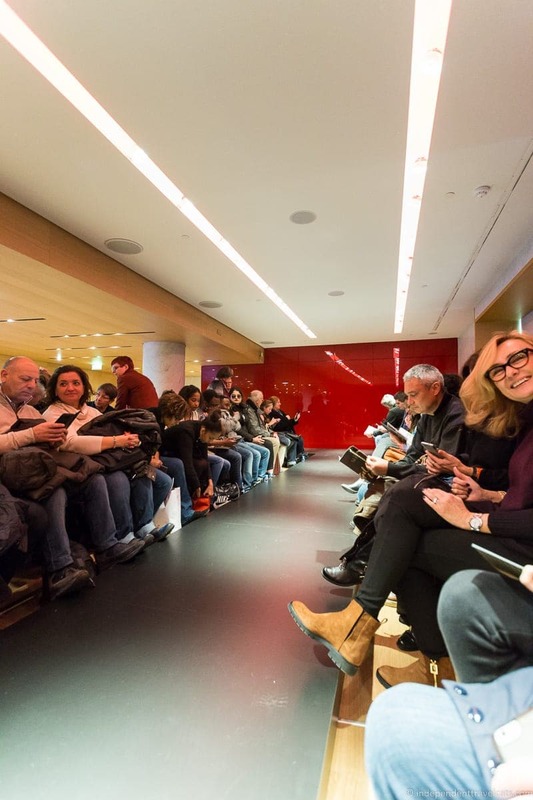 Before we share our experiences at the Paris fashion show at Galeries Lafayette, we wanted to share all the basic information you need to plan your own visit to this event. Address: Garleries Lafayette, 40 Blvd Haussmann, 75009 Paris. The fashion show has always been in the main store, the Lafayette Coupole at Galeries Lafayette Haussmann. On our most recent visit it was in the Salon Opéra on the 4th floor of the store near the lingerie section. You’ll see a line start to form by a door here near the show time. Check your email confirmation for the latest information as it has been held in other locations in the past. Galeries Lafayette is easy to reach by public transit although it also has a dedicated parking garage if you are driving. Parking: Galeries Lafayette parking garage. Entrance on Rue de Provence in Lafayette Homme building. The fashion show takes place on most Fridays at 3pm (15:00) throughout the year. They also now have shows on Mondays at 3pm in the summer months as well. The fashion show lasts 30 minutes. Although you are asked to show up 15 minutes before the show begins to check-in and be seated. If you arrive after the start time, you will probably not be allowed to enter the show, so be sure to allow yourself plenty of time to get to the store and find the fashion show location. Cost of the Galeries Lafayette Fashion Show? Current price of the fashion show is 13,90 euros per adult and 9 euros per child. Note that this used to be a free fashion show for many years but the store began charging admission as of 2017. How to Buy Fashion Show Tickets? You need to purchase tickets in advance to attend, and the easiest way to buy tickets is online through this site. Seating is limited so you must have advanced reservations. Bring your confirmation voucher and an ID to ensure a seat. The dress code is smart casual. So best not to come looking like a casual slob, but guests during the two times we attended were wearing everything from jeans to business attire. For the Galeries Lafayette main store website, click here and for the store fashion show info, click here. Galeries Lafayette is a huge historic department store that sells clothing, fashion accessories, home goods, cosmetics, food, and more. There are also a number of cafes and restaurants here if you get hungry. The store also offers other activities you can do including a history walking tour, a macaroon baking class, or French wine tasting class. For more information on planning your trip to Paris, check out our other Paris articles, such as our our suggested 3 day Paris itinerary, reviews of the Paris Pass and Paris Museum Pass, Eiffel Tower visitor guide, Seine River cruise guide, and Paris afternoon tea guide. After you decide you want to go, you’ll need to confirm that there is a fashion show happening during the Friday (or Saturday) that you are visiting and then make a reservation. There used to be a number of ways to book tickets, but now almost all booking are taken online. You can book tickets here or use this online booking system, both offer the same tickets at the same prices. You simply choose your date, number of tickets, and purchase them online. After your purchase, you should receive a confirmation email with your ticket that you will want to print it off or have it on your phone to show to gain entry at the show. You’ll need the ticket and your ID to get into the show. If you have questions or want to book a private fashion show event you’ll need to email them at: mice@galerieslafayette.com or events@galerieslafayette.com. As I noted above, the free fashion show at Galeries Lafayette has taken place in different location within the department story over its history. I’ve attended it in two different rooms in the times I have gone. So just be sure to check your email voucher and follow the directions. The Galeries Lafayette is huge and located across multiple buildings so it is good to check out the store map beforehand if you are not familiar with the store. Be sure to arrive a little early to be sure to find your way to the fashion show. If the fashion show is still taking place in Salon Opéra on the 4th floor of Coupole, you’ll want to enter the main building of the Galeries Lafayette (not the Lafayette Maison or Homme buildings), and take the main escalator to the 4th floor. The Salon Opéra is located near the lingerie department. When we arrived last time, we wondered around the lingerie section a bit before asking a store associate who pointed out a woman with a clipboard. We were about 30 minutes early, and she told us to return in about 20 minutes as they do not normally open the doors until at least 15 minutes before the show. If you get lost in the store, the main Information/Welcome desk is located on the ground floor (Floor 0) and any of the store employees should be able to point you in the right direction. 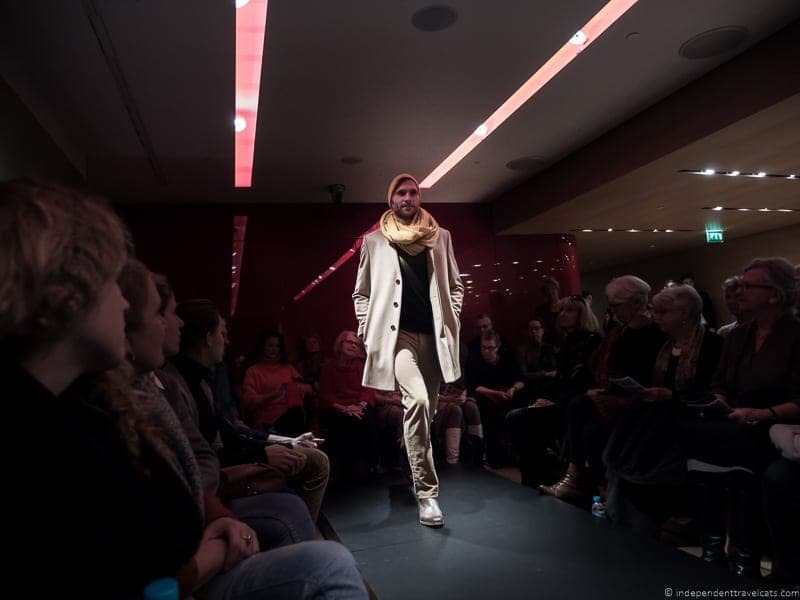 This is of course a department store fashion show in Paris with models showing off read-to-buy clothing, and not a haute couture show during fashion week. While they try to stimulate a real fashion show, the room itself felt a bit like a small business conference room with a small runway and lots of chairs. But the dimming of the lights, provided program, spotlights, and upbeat music helps make up for this. The room can be a bit warm with so many people seated side by side, so you might want to dress in layers. Back in 2013, it was clearly written that photography and videotaping was prohibited (although blatantly ignored by many); however, I saw no such rules during our 2015 visit. I imagine that videos are likely prohibited, but photography seemed to be fine and most people were discreetly taking photos on their phones during the show. Just don’t bring an iPad and obstruct the views of others behind you as one man did during my 2013 experience when were sitting in the second row! It is best to get there a bit early to get a seat in the front row. It is a narrow t-shaped runway with people sitting on each side and at the very end of the runway. In 2015, there was no choice given to seating and people were seated in order of arrival next to the prior guests. However, it is worth being there when they open the door so you get a seat without someone sitting directly in front of you. There was only one row on the side we were sitting, but there were three rows on the other side. However, the room is quite small with seating for 100 people or less so you should be able to see relatively well no matter where you are seated. In 2015, we found a bottle of water and a fashion show program on each seat. Programs are provided in English (almost all attendees appeared to be from English-speaking or Asian countries) that list the clothing items and labels worn by each model in order of appearance, which made it easy to follow along. As of the 2015 show, there were also photos in the brochure of the models wearing each outfit so it was even easier to link each clothing item to the ones worn by the models on the runway. During the shows, the clothing is grouped into separate themes (e.g., Palm Springs, Vintage, American Retro) with clothes and shoes by a variety of designers including Michael Kors, Marc Jacobs, Tommy Hilfiger, Eden, Kooples, Tara Jarmon, Ralph Lauren, Manoush, Minelli, and Diane von Fürstenberg. While most of the clothes are for women, there was one male model who appeared several times on the catwalk to show off some clothing from the Men’s Store. Below are several pictures from our visit in 2015. If you are interested in any of the clothes during the show, the program provides the brand and the floor of the store where you can find them. What was surprising to me is that once the show is over, the models go backstage, the lights come back on, and the room is quickly cleared. There wasn’t really anyone around to talk to about the clothes. If the goal is to sell the clothes, the store would probably get more customers to buy them by having either sales associates or the models circulate and talk about the clothes and where they can be purchased for a brief period after the show. Overall, it was an entertaining 30 minutes and definitely worth it as it was a free fashion show in the two times I attended. Obviously, now there is a booking fee so you will have to decide if it is worth it or not. It can be a fun show for those interested in fashion. The other attendees in both shows seems to enjoy themselves. 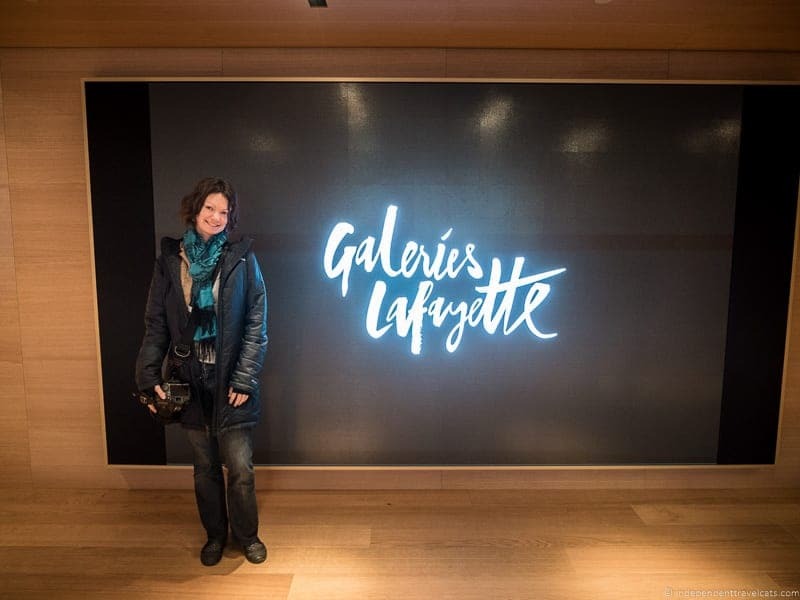 Given that Galeries Lafayette (and nearby Printemps) also happens to be a perfect place to do some shopping (clothes, accessories, home decor, souvenirs, and gourmet food!) or take a break for a meal or coffee, you can really make a full afternoon out of your visit. Or consider booking another activity at the store such as a history walking tour, a macaroon baking class, or French wine tasting class. You might also consider visiting the nearby Palais Garnier by taking a tour or attending a performance which is another of my favorite buildings in Paris. I’d also recommend checking out the Fragnord Perfume shop and museum (near the opera house, free to visit), and you can even book a perfume making workshop here! So what did you think about this post? We’d love to hear any of your thoughts or questions. During your next visit to Paris, will you be attending the fashion show in Paris at Galeries Lafayette? Hi Jessica, Just booked to do the fashion show in Paris this weekend – great tips! Simply wish to say your article is as astonishing. Thanks for all the helpful info about the Paris fashion shows, this answered all my questions! Thanks for posting about this! I learned something new and just made a reservation for Friday August 19 to take my niece who will visit us in Paris – she is hugely into fashion! Thanks! Good morning ! (From Canada) I actually tried to reply to the email but it bounced back. I’ll have to contact them using another email I guess. I am going to Paris with my 18 year old daughter in June 21-28, 2016 and it is now March 1st. After viewing your blog I clicked the link for the fashion show and they are booking through our week! I was able to get 2 seats confirmed today for the Friday in June! We are so excited to attend. Going early to see and shop, then get in line for good seats. Thank you for this blog. I will go back now and read what else you offer. Hello and greetings from Canada! I have sent an email for registration on this free fashion show event; I am very excited to be in Paris and celebrating my birthday also being my first time in Paris. Are there any other venues where we can view the celebrities or any of the models that you can recommend? As well, how does one purchase tickets to the Fashion shows or even one show? Any information will greatly be appreciated. Hi Shabi, I am glad that you are planning to attend the free fashion who at Galeries Lafayette in Paris. It is just a department store-run fashion show that shows off the new collections available in the store. For the best seats, come a little early and get a seat near the stage. To respond to Deb’s question, I recently went to the free fashion show and there was a group of young girls (I’d say between the ages of 8 and 12) with their parents in attendance. The attendants even moved the girls to the front upon the father’s request so that they could see the show better. They seemed to absolutely love it. Hope that helps! Thanks Stefanie, that is very helpful information and should help other readers with children. Thanks for taking the time to comment. Hi. Do you know if children (8 and 10) could attend the fashion show? Wow I have never been to a fashion show! It looks so fun! Thanks for sharing. 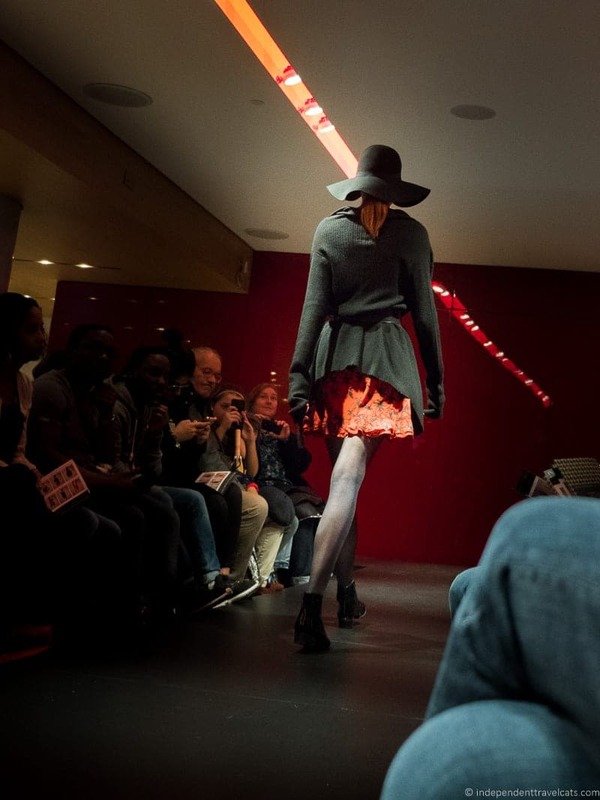 Yes, it has to be the most accessible fashion show in Paris! Certainly worth a reservation if you enjoy fashion and happen to be in Paris. The beauty of the Galeries Lafayette glass dome area is enough to keep drawing me back. Hi 🙂 I’m not hugely into fashion, but that photo of les galeries lafayette has amazingly made me want to go there just to see it… now to convince the mister…. Erica, thanks for stopping by. 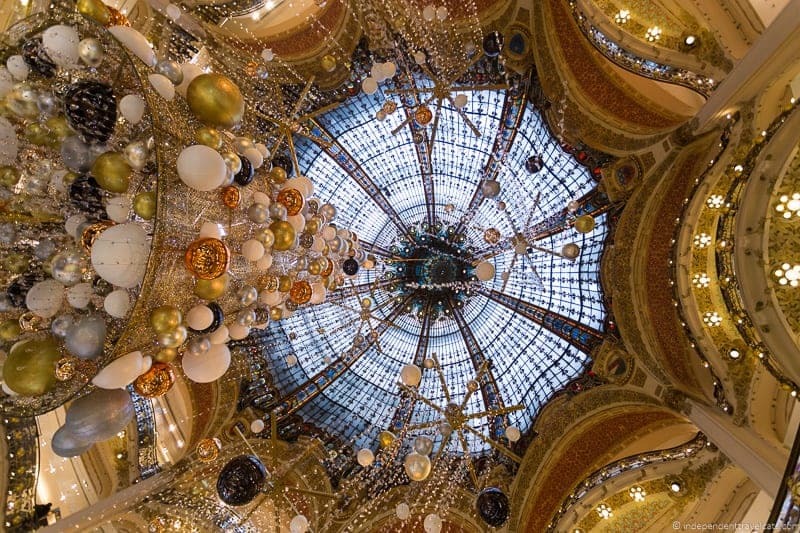 Yes, my favorite thing about the Galeries Lafayette is the beautiful dome ceiling, although the whole building is lovely. We have never bought clothes there (most are well out of our price range), but we have never left without some gourmet food goodies.